This week was a whirl, filled with holiday gatherings, a play at the Children’s Theatre in Portland, and lots and lots of driving children to various appointments and events. When I came up for air, I made a batch of butterscotch chip cookies, and used up some cornflakes I’d had for a while. They were the natural ones, and soaked up all the liquid in the batter, so the results were less than stellar. They were dry. I got another bag of the butterscotch chips, as they are on sale this week, and will try again. It is difficult to find gluten-free corn flakes, but I do have some that are thinner and crispier, I hope. I will also add more liquid and another egg. Sometimes the gluten-free flour is a little different. We had breakfast at Bob’s Red Mill. We had a lot of fun visiting with our son, and one of his friends who works there. 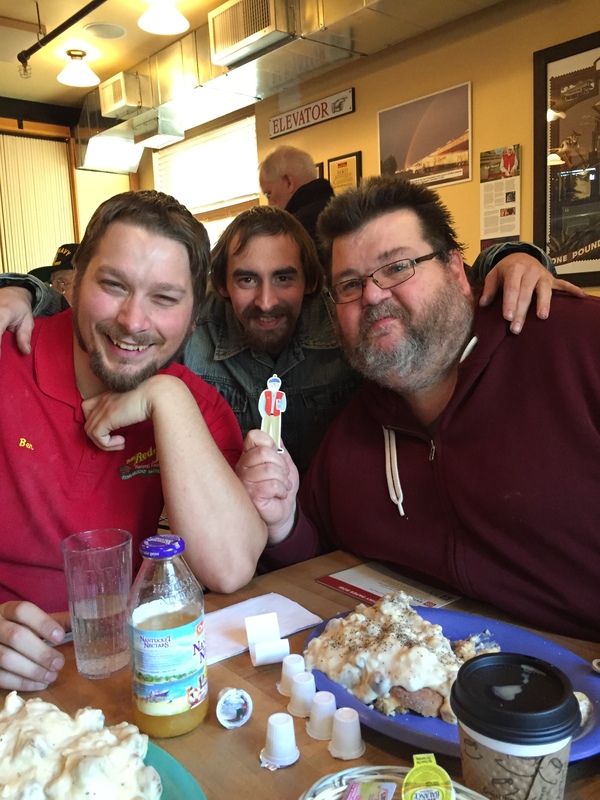 We also took a lot of pictures with “Little Bob” and are planning to enter the contest they are having, just for fun. We put ‘Bob” in a bottle, Bob in a tree, etc. 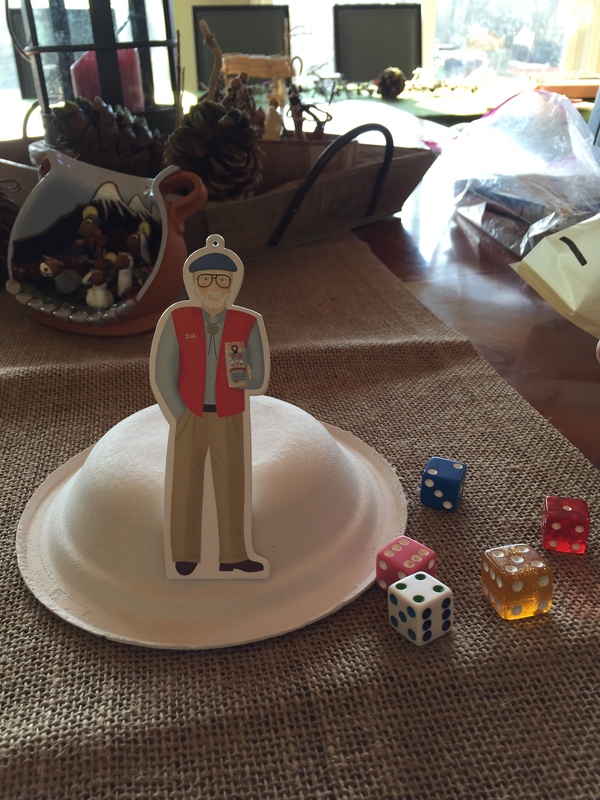 Bob even played Yahtzee with Michaela on Sunday, but she sure thought I was strange when I took that picture! Anyway, they gave us a free bag of Scottish oats. I guess we seemed like we were enjoying ourselves, or maybe it was because we were friends with Adam, but we were thankful! The play we went to was Cinderella. It was well done, as always, and took the twist that Cinderella only wanted to tap dance, and that’s what she and the prince did. She lost her shiny tap shoe at the ball… Very cute! One of my friends and her children went with us, and we had a great time visiting. We went to the school matinee performance, so it was very reasonable. I did get some cornbread and soup made. We also had salad and lots of potatoes. I was able to find a lot of very inexpensive grocery items that I bought to donate to various places. They are collecting at Rob’s work. They need donations at church. Patsy’s school is collecting. I don’t feel like I single-handedly need to fill all the barrels, but love to be able to help with 50c/box macaroni, 33c/can veggies, and other items that are really on sale right now and can make the donation $ stretch so much farther. I set aside some items for later when they ask for donations, as the prices are really low right now. We are also giving food gifts to some people and got some of what I needed for that. And, of course, I filled up my supply of 99c sugar, 99c for 18 eggs, and a bunch of other items. So, I put quite a bit of energy into shopping this week. We also got most of our Christmas shopping done. We went pretty simple this year, and now need to wrap it and sort it into piles for the various places we are going to celebrate. When you have many children, and some of them have children, and you have a large, extended family on both sides, it can sometimes be a bit overwhelming. This week is quieter. It is the last week of school before the break for everyone, and so we will put our usual amount of time into that. I hope to do some cooking and baking and cleaning, in preparation for Christmas. We will be having guests, and I need to go out and fix the camper up in preparation–we use it for a guest house. I’m looking forward to it very much! I love it when I can find sales and use frugality to bless other people. Great finds for the food collections. 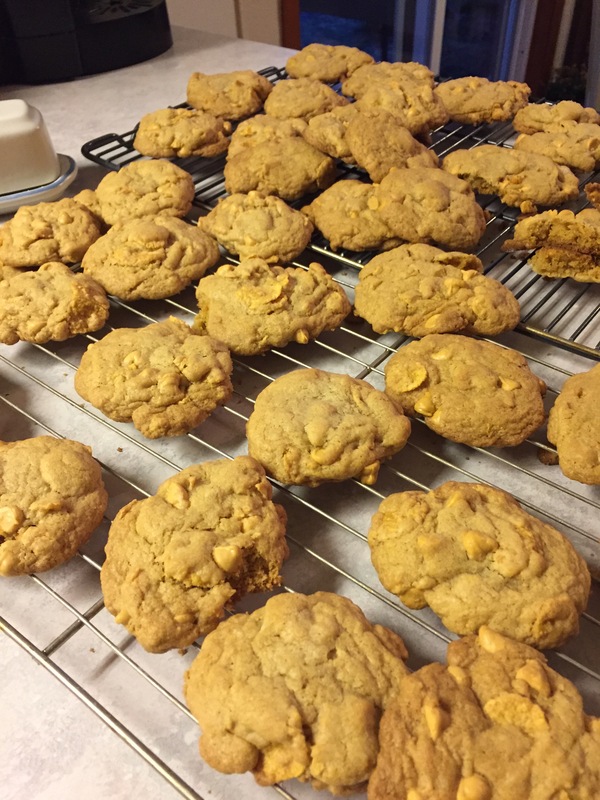 How do you make your butterscotch cookies? 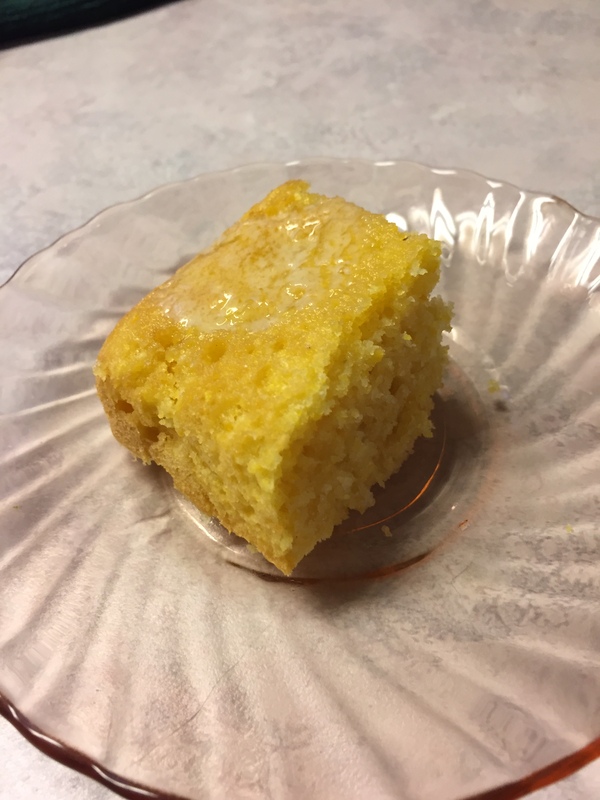 I used a recipe I used to make before I became gluten-free. I will need to do it again, using thinner cornflakes and a little more liquid. If they turn out well, I’ll post the recipe. I have great luck with the Bob’s Red Mill 1-1 flour most of the time, but this recipe needs a little tweaking before it’s ready, I think because of the thicker, natural cornflakes. Homemade soup and cornbread sounds delicious. My kind of meal. Yes! Us, too. Around here, it’s called Fred Meyer and we love how they have everything in one store–from natural foods, to clothing, to other food, to gardening….it’s really handy. Well, the cookies look good! Rob said that at his school, they have not received the donations they usually do, but couldn’t have a contest like normal because they found that the kids were taking the items they had been given in their food baskets and putting them in the barrel to win the contest…..not eating them:(. So, that’s one reason they asked the workers to bring some if they could. The cookies definitely look good, even if the texture wasn’t quite to your liking. I’m sure they tasted pretty good too. Maybe if you dunked them in some milk before eating, they might soften, a bit. I, too, stocked up on a few items (although the Kroger affiliate store here didn’t give me the sale price on all of it and I had to go back to get the refund! ); I, too, will be donating some of it. Hope you have a lovely week, ahead.